The phone rings. The opportunity of a new client gets you excited and you pick up the phone full of energy and ready to tackle those ‘why you’ questions. Next thing you know, it’s an ask, not an offer. Though sometimes free or discounted work can be a necessary evil for growth (both creative and professional), it is one to tread lightly near. When designers are starting out, whether it be Film, Graphics, or Print, they tend to get dragged into these situations quite often. They don’t want to turn any business away and rationalize doing a little bit of work to pave the way with “FUTURE” work for a “POTENTIAL” client. The reason that I put both “Future” and “Potential” in quotes are for the simple fact that they do not represent the PRESENT timing. Both indicate that some paying work with this client may happen down the line but not necessarily in this exact moment. When you run your own shop everything is “overhead” if you are missing the opportunity of generating income. Want to stop for a coffee? OVERHEAD. Take an extra 30 minutes on lunch break? OVERHEAD. The time you spend on unbillable hours will invariably COST you money. Why do I bring this up? Well, it’s simple. 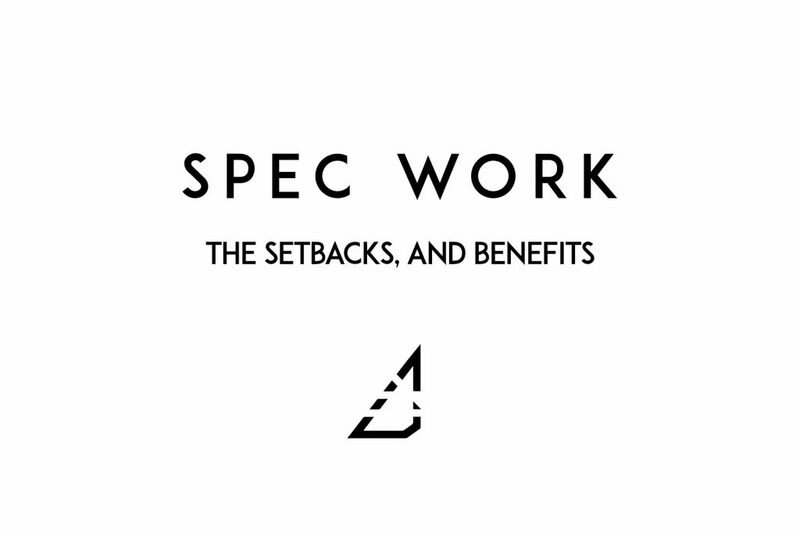 That extra time that you would spending on the Spec design is time you could have been spending working on paying work or seeking new immediate paying work. There is no time like the PRESENT for a small business owner. We face enough challenges with local and federal economical changes…there is no reason to add more expenses. HOWEVER, you also cannot just expect people to give you money without seeing what you have to offer. Make sure that your portfolio is an accurate representation of your skill set. If you have a killer portfolio and the client still wants you to work for free, respectfully decline that opportunity. Your time is just as valuable as the next person. Think about it – would you walk into a bakery and look at all the pastries but ask the chef to give you the first one free because you are unsure of how it tastes? Exactly, you wouldn’t. As a professional you should (and doing so often) take a step back and look at your portfolio as objectively as possible. If you feel that it doesn’t look like your current skill set, then it may be time for you to come up with a concept or find a business relationship that you can nurture in a mutually beneficial project. Running an agency isn’t a sprint, it’s a marathon. While you are constantly refining your portfolio you also need to remember to put your best foot forward. You have a lot of legwork to do in preparation for your proposal writing. Develop a plan first and display how you will execute it once provided the startup payment. In my experience, selling someone on an “Idea” is much easier than selling someone on an existing design and a lot less time-consuming. The idea is malleable and can evolve as the project progresses. This is beneficial to both client and designer. The creative designer has a bit of room to play with and will client will reap the benefits from that. I find that once someone is focused on the minutia, it is extremely hard to get them to look at the big picture. – and ensure you are taking on the right projects at the right point in your career. There is nothing wrong with experience, but unless this work is a hobby, you need to learn to make a living from it. Cut costs where you have to – hell I worked out of my parents house when I first started out. But I accepted the right opportunities and declined the wrong ones. Visit www.omnislashvisual.com/work to learn more.